Tavern Hodač is very popular tavern, located near Vukov monument, at No 1 Dimitrija Tucovića Street. Tavern Hodač is mix of tradition and modern. 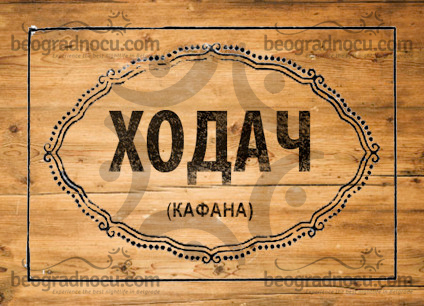 Wooden interior, plaid sheets, with lyrics on walls that have marked each of your drunkenness, barrel which pours homemade rakija and delicious beer. On drink menu that is made in authentic style, prices are the same. Where can you find Zaječarsko beer for 100 rsd?! Tavern Hodač nurtures tradition because Tozovac, Miroslav Ilić, Zvonko Bogdan and Toma Zdravković are watching you from wall and remind you of the role of tavern. Here every night can hear music and laughter, while Žuća and Nole on harmonica and guitar will conquer your heart with their beautiful music. This is one of the reasons why guests always come back. Finally, girls started to visit taverns. Time when girl was felling uncomfortable in tavern has passed by. Men can be gentlemen like it used to be modern and today is desirable. Hodač is trying to revive bohemian tradition, time when tavern was institution, because today there are no true bohemians even though many of them are mixing vinjak and beer to look a like. Some people are just scared for their health and they rather go to gym. You should be brave and just come. Old mister is waiting on a three sou you should come ''One smoke, one more glass, one song an one girl'' like in the song of Đura Jakšić, and we will guarantee you that you will come back for more. Remember: Tavern is monument dedicated to free life and lace of rebellion against mental prison. Think about it. Tavern Hodač is one of the best bohemian and traditional taverns at Zvezdara, that provides you quality night out with amazing live traditional music, delicious drinks and beautiful interior decorated in spirit of Belgrade. Tavern Hodač exudes with amazing atmosphere and it's meant for all people who are looking for god fun. Make a reservation on time and spend pleasant moments in tavern Hodač. Affordable prices, wide selection of drinks and friendly staff are waiting for you.